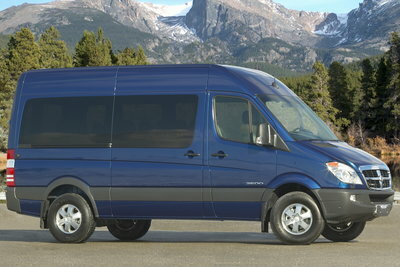 The Sprinter Passenger Wagon model can hold up to 12 passengers in its spacious cabin, and is available with two wheelbases and two cabin heights. Other configurations include models that accommodate 7, 9, or 10 passengers. The powertrain is a 3.0L V-6 turbodiesel mated to a standard 5-speed automatic. Total GVWR is 8,550 lbs. Standard features include airbags, power windows/locks, AM/FM/CD audio system, and Adaptive ESP (Electronic Stability Program). A comprehensive options list allows small business and fleet buyers to customize the Sprinter to their needs. The gas-powered models have been discontinued. An electric power-sliding door is available.